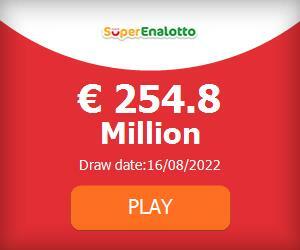 Get-Lottery.com - Italy - SuperEnalotto current jackpot: € 142. The next draw will happen on 27/04/2019. This lotto has 1 review(s). What is your biggest win amount? I did hit a Jackpot! How to choose lottery numbers? Why lottery prizes go unclaimed? SuperEnalotto is a lottery that has been played in Italy since 3 December 1997. 'Enalotto' is a well-known Italian lottery which has existed since 1950's. In 1997, SISAL modified the 'Enalotto' lottery to create SuperEnalotto. Until June 30, 2009 the six main winning numbers were taken from the first number drawn in Lottomatica's regional Lotto draws for the cities of Bari, Florence, Milan, Naples, Palermo & Rome (used in that order). The Venice draw was used as a "Jolly" number. If the first number of a city had been used before, then the second of the city's draw was used - and so on. In this system there was a small probability that the numbers of two cities could be the same - in which case there would have been duplicate numbers and it would have been impossible to win the jackpot. Draws take place on Tuesdays, Thursdays and Saturdays at 8:00 PM. The jackpots won are among the largest in the world, and the odds of winning one of the lowest in the world. After more than 8 months of rollovers, the largest single-ticket jackpot up to date is worth €177.7 million ($248 million). This was won by a syndicate of 70 winners on October 30, 2010. €147.8 million (US$205 million) was the 2nd largest single-ticket jackpot won on 22 August 2009 in Bagnone (Toscana). Only one winner so he's the biggest prize winner. Very popular in Italy and across Europe, high Jackpot, I love this lottery. Your guide to best lotteries around the world! Ancient History, the first winners of lottery in history. Who invented the lottery and keno? History of lotteries in Europe (1466 – 1933). First state lotteries and winners in France, Italy, Netherlands, Spain and others. The emergence of lottery in England. First winners and tradition of state lotteries. Official European lotteries. Official European lotteries. EuroMillions, SuperEnalotto, El Gordo, and others.